Some Daily Fantasy Players load up on Top Guards but many times the most consistent top fantasy point scorer on a given night is a forward. 2015 sees a list of Top 10 Forwards who can be the difference between you winning a HUGE payout at FanDuel or finishing way out of the money. Everyone has their own NBA Daily Fantasy Basketball Strategies to win…it’s up to you to develop yours. Last year FanDuel gave away a check for $1 Million to someone at the World Fantasy Basketball Championship in Miami just for putting together a salary cap fantasy basketball lineup. You can win a Million Dollars too but you need to start playing at FanDuel first. Join FanDuel.com and when you make your first deposit get 5 Free Fantasy Contests to play in. FanDuel has partnership agreement with the NBA who as part of the deal has an equity stake in FanDuel. The NBA promotes FanDuel as the “Official One-Day Fantasy Basketball Game” of the NBA. If that doesn’t convince you that you should be playing your fantasy basketball games at FanDuel…then nothing will! Missed most of last year with injuries (but that’s why we play Daily Fantasy Basketball and not full season!) 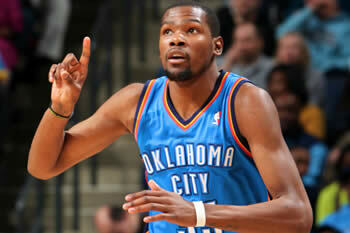 Look for Durant to fill the stat sheet up every night! Also in a contract year! Yes the King can do it all for your fantasy basketball team, but has nights that he lets others on the team take over. The best player on a bad team usually gets all the fantasy points. The Knicks are still bad which means ‘Melo’s numbers will be good. If he could only shoot 3’s! Double-double every night plus a 3 block a night average – Davis is an elite fantasy basketball play every night. Injuries sidelined him last year but look for George to once again fill up the stats for your DFS lineup. Double-Double every night average with almost 2 blocks a game. Usually counts as both Forward and the Center position. Nice having a Top Guard feeding you the rock to get 20+ points a night. Gets the boards and high FG % but not much else. Good solid stats every night but doesn’t cost you a lot of salary cap money for your FanDuel lineup. The Big free agent signing of the Spurs will still put up numbers…but he’s no longer “The Man” so look for numbers to drop. Nice numbers last year but with Aldridge coming into town, looks for Leonard’s numbers to drop a bit. Still a good DFS play is the salary cap price is low.